Kraftwerk is a electronic band from Germany that became famous in the late 1970s and 1980s for making electronic music. They used a synthesizer to make the rhythms and melodies in the song. Kraftwerk made electronic music many years before other bands knew it would be popular. They paved the way for the MIDI and digital styles of music to become popular in the 1990s. 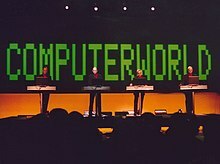 Many of the sounds from songs such as "Computer Love", "The Robots", and "Trans Europe Express" can be heard sampled by a variety of bands on their current releases. 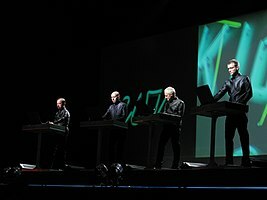 Recently, some of Kraftwerk's original recording equipment was sold on eBay for astonishing amounts. Kraftwerk continues to have a faithful following. The band's name is German for power station. This page was last changed on 23 February 2017, at 16:16.